Passed the PenTest+ beta exam! 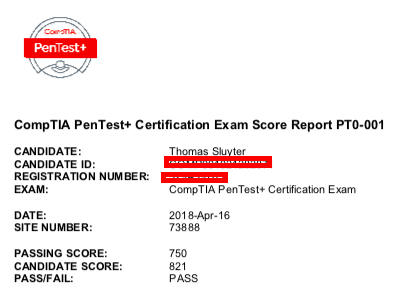 A bit over three months ago, I took part in CompTIA's beta version of the PenTest+ exam. It was a fun and learning experience and despite having some experience, I didn't expect to pass. Now, I hope that some of the feedback I provided has been useful. That's the point of those beta exams, isn't it? Three months ago I took the CompTIA Pentest+ beta and not half an hour ago I finished the CertNexus CFR-310 beta. Like before, I learned about the beta-track through /r/netsecstudents where it was advertised with a discount code bringing the $250 exam down to $40 and ultimately $20. Regardless of whether the certification has any real-world value, that's a nice amount to spend on some fun! The Examity proctored, on-premise test-taking works very well. They don't use nasty installers that run software with admin privs on your system, they simply use GoToMeeting to monitor your mic, cam and screen. Effective and not too intrusive. The questions were a nice mix between technical knowledge (knowing various tools and some basic scripting and flags) and procedural knowledge (policies, standards, regulations, processes). Overall the required level of expertise seems rather basic and in retrospect it feels like most of the information can/will be spoonfed during the classroom/online cours. Now... Is the CFR-310 certification "worth it"? As I've remarked on Peerlyst earlier this week: it depends. If you have a specific job requirement to pass this cert, then yes it's obviously worth it. Then again, most likely your employer or company will spring for the exam and it won't be any skin off your back. And if you're a forward thinking contractor looking to get assignments with the DoD, then it could certainly be useful to sit the exam as it's on the DoD 8570 list for two CSSP positions. If, like me, you're relatively free to spend your training budget and you're looking for something fun to spend a few weeks on, then I'd suggest you move on to CompTIA's offerings. CertNexus / Logical Operations are not names I'd heard before and CompTIA is a household-name in IT; has been for years.